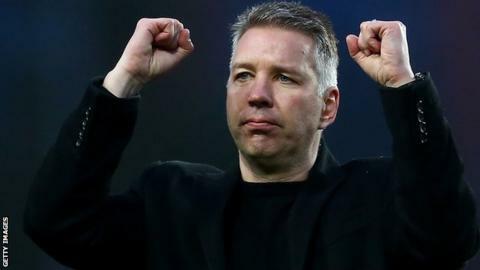 Darren Ferguson has signed a three-year deal to remain as Peterborough United manager beyond the end of the season. He returned for a third spell in charge of the League One side after the sacking of Steve Evans in January. Ex-Doncaster and Preston boss Ferguson has led Peterborough to promotion on three occasions, and the club are just two points outside the play-off places. "This decision to appoint Darren on a long-term deal was a unanimous decision from us," said the club's co-owners. "The style of play, production of young players, taking on young and hungry talent and developing those players is what Peterborough United is renowned for and in the last 18 months we have veered away from that." Ferguson's assistant Gavin Strachan has also agreed a three-year deal with the club. Peterborough were sixth when Ferguson was re-appointed, but a run of just two wins in nine games since then has seen them fall out of the play-off places to eighth. The 47-year-old Scot, son of former Manchester United manager Sir Alex, first took charge at London Road in January 2007 and led the club to back-to-back promotions from League Two to the Championship. He left in 2009 but returned in January 2011 and guided them to promotion via the League One play-off final four months later. Co-owners Darragh MacAnthony, Jason Neale and Stewart Thompson added: "Although the results on the pitch have not been anywhere near where we would have liked, it is not about the current form, it is about the long-term aspirations of this football club.